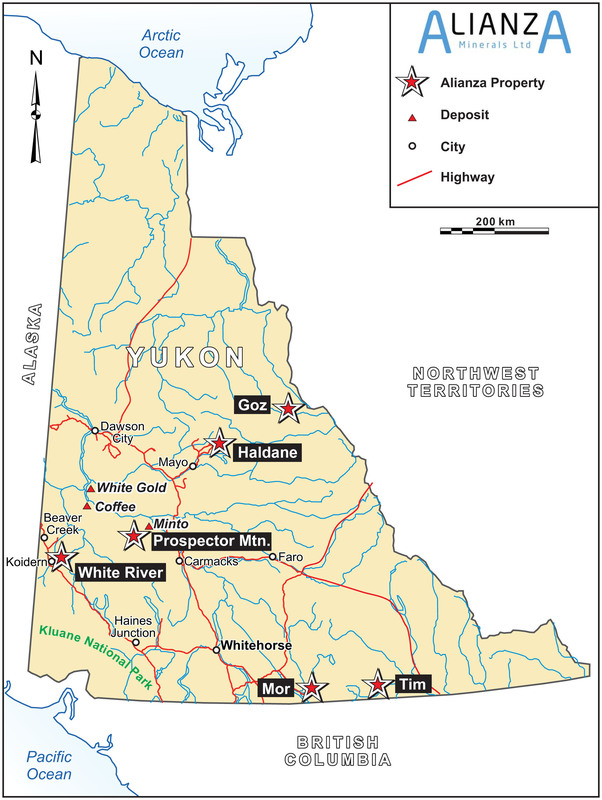 The Prospector Mountain property consists of 271 mineral claims (5,660 hectares), located 90 kilometres northwest of Carmacks, Yukon. Other significant properties in the area include Sherwood Copper’s operating Minto copper mine, 30 kilometres to the north-east and Western Copper’s Carmacks project, currently in the permitting phase for mine operation, 55 kilometres to the south-east. The property lies within the Dawson Range portion of the Tintina Gold Belt and covers an area of hydrothermal alteration and mineralization indicative of both a porphyry copper-gold and epithermal gold-silver mineralizing environment. Copper-gold mineralized and K-silicate altered Cretaceous intrusive rocks outcrop on the project as well as banded quartz veins that have returned high silver and gold values from samples taken in historic work programs.